Upgrade from stock wheel help - Miata Turbo Forum - Boost cars, acquire cats. If you are 100% certain that you will under no circumstance want to roll the fenders, then stick with a 7" wheel. The only ones I will recommend are the Super Miata 6UL wheels. SuperMiata949 designed and built them specifically for our community. Major brands have ripped him off; I am a small business and know the frustration, hence my loyalty. Call them and they will not let you down. 15x10 is good for street use. 15x10 +36 with a 245/40-15. Slammed 93 LE. Fits great. Thank you for the quick responses!! If a 15x7 with any thing over +30 works then a 15x6.5 with +38 should fit no problome. A 15x6.5 zero offset should fit no problem. Stretch some 165s on those bad boys and air them up to 45-50psi to gain 2mpg. Rad. Goodwin Racing's website has a lot of choices in Miata fitment. 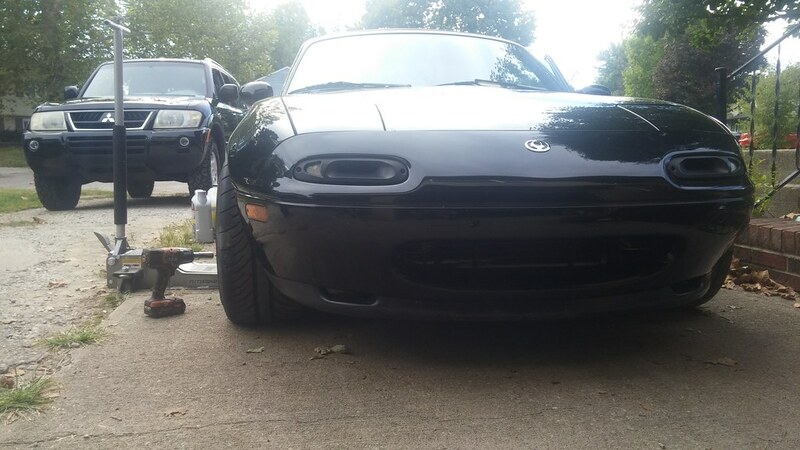 I was leaning towards 15x9, but someone I met recommended to go with 15x7 (spec miata size) and from some reading on this forum I should also go cheap with tires, and learn on those. All these sizes and offsets are making my head explode... too much information!! 15x8 +36 fits everything. Ever. Without rolling. With 205/50. Good starter setup. Do that. I've been told that the advantage to starting with 'cheap' i.e. not race spec rubber, so performance summer tires vs tires that are 200 treadwear just for class rules, is helpful because the tires give you more warning when they let up. 15x8's should be more than fine to start on. Gain experience on those with cheaper 205's, especially while you're still NA, and then move on when you feel the need. You don't need spec wheels because you're not racing spec miata. If you're trying to stay in class for autocross, you need to become best friends with the rulebook. That's bad advice, kinda like running cheap brake pads cause you won't be hard on the brakes. What happens is you smoke the pads in two sessions and peal the outer shoulder off the tire as well and you're left replacing them in short order. They just can't handle the heat of track work. Run an endurance 200tw tire for track use, RS4 is a great example of that. I've seen reports of 30hr+ track time, I'm up to 10hrs with a few Autox and a few thousand street miles, not anywhere near half worn. ​​​​​​If you have coil overs (for clearance) and willing to roll the fenders you're doing yourself a huge disservice running anything but 9's and 245 RS4'S. Ok got it. Stay away from 15x7. So I'll be looking at 15x8 with 205/50 to begin with, possibly change later on when I get more experienced. I believe that's what I have now but they look awful. I will soon be having coilovers too, so ride height should change. I think we are discussing a setup for "track noobs", like myself. Getting cheaper tires and getting to know better the limits of the car is more valuable than just use sticky tires that give a false sense of being good at driving. I've read posts, by 949 racing, in which they do recommend 15x9 but I was just asking where I should start from.